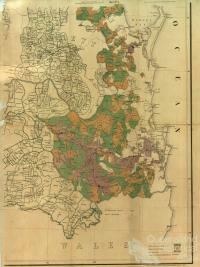 From the 1820s, scarcity of good land led pastoralists to establish runs on the Darling Downs and east of Moreton Bay. The need to define legally the boundaries of land in southern Queensland eventually led to the production and publication of a map detailing the surveyed runs in 1872. By ancient definition a run was a large area of land on which animals were depastured without the need for a lot of fencing. The early Australian run relied on the use of shepherds who at various locations on the run looked after a flock of sheep. By day the sheep were allowed to roam followed closely by the shepherd and his dog. At night the sheep were placed in portable yards formed by moveable rails. To avoid the yards being fouled, they were moved frequently. In 1813, Blaxland, Lawson and Wentworth discovered a route through the Blue Mountains to the west of Sydney. These ranges had been a major barrier that had hindered the development of the colony of New South Wales. This discovery of the well watered and lightly timbered Bathurst Plains soon had large stock holders moving their flocks out onto these plains. By the 1830s the squatters had advanced as far as the New England Tablelands to the north and Port Phillip District to the south. In an effort to control the unauthorised occupation of the vacant crown lands beyond the settled districts, the Government passed the Crown Lands Unauthorised Occupation Act of 1839. This Act allowed the squatters to obtain an annual licence to depasture their stock beyond the settled districts as described by the Act. By this date good pastoral land in the New England Pastoral District was scarce and the newcomers had to go even further north. One of the first pastoralists to do so was Patrick Leslie who by using records from Cunningham’s expedition to the Darling Downs in 1827, settled a run called South Toolburra close to the present day location of Warwick At this time, his run was in the New England Pastoral District. Others soon followed and took up licences both on the Darling Downs and to the east around Moreton Bay. With a proclamation dated 11 February 1842 the settlement at Moreton Bay became a free settlement, having been a penal colony since 1823. With the new increase in settlers, a Moreton Pastoral District was gazetted in 1842 and the next year the Darling Downs Pastoral District was gazetted, replacing the New England District. The 1839 Act had given the pastoralists no security of tenure and allowed for no compensation for any improvements during the occupancy of their run. After much debate, mainly between the influential pastoral interests on the one hand and Governor Gipps on the other, an Imperial Act titled The Waste Lands Occupation Act of 1846 was passed. This Act gave the pastoralists the right to obtain a lease rather than a licence. The period of the lease varied from one to fourteen years depending on whether the run was located in a Settled or Unsettled District. It also gave the lessee the right of pre-emption to purchase land around their head station and other improvements. When tendering for new runs under this Act the applicant had to provide a clear description of the boundaries of the run. These descriptions mainly relied upon the geographical features (rivers, creeks, ranges etc) in that area, as well as references to any surveyed lines or trees marked by the applicant on adjoining leases. The Government’s desire was to have the boundary of each run surveyed so that exact descriptions could be inserted into the instrument of lease rather than the description given to them by the applicant in their tender document. In reality during the 1850s the high demand for leases coupled with a shortage of surveyors forced the Government to advise the pastoralists to hire a private surveyor to carry out the survey at their own expense. Most squatters however were content just to rely on the Government’s promise of a lease. It is interesting to note that the prescribed area of a run had previously been fixed in 1845 as 25 square miles, the same area also prescribed for the size of parishes. This is why many parishes take their names and locations from these early runs. Before 1868 there was little thought or encouragement given to bona fide agriculturalists — rural Australia had been the domain of the pastoralist. This all changed with the Crown Lands Alienation Act of 1868. This Act allowed the Government to acquire half of the squatter's run either by resumption or voluntary surrender. This resumed half was then to be surveyed into blocks suitable for selectors looking for smaller agricultural farms. The run holder in return would receive a new lease on his half of the original run as well as other benefits. By this policy the Government was able to achieve their objectives of closer settlement with more people using the same area of land with the added benefit of an increase in rent. The cost of this exercise was to be shared between the Government and the lessee. A feature survey of the run had to be made by a licensed surveyor before the district commissioner could divide the run and finally the dividing line had to be surveyed. 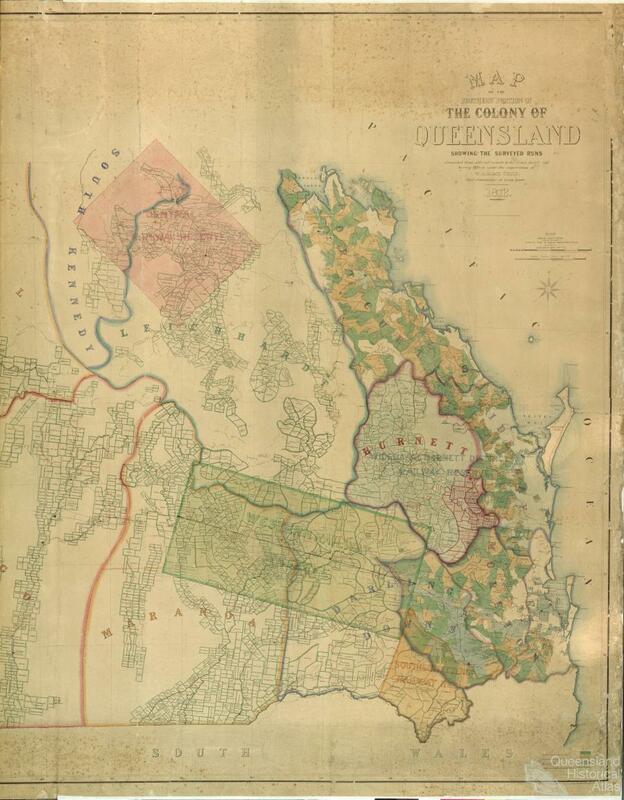 By 1872 many of the runs in the pastoral districts of Southern Queensland had been surveyed and the Surveyor General of the time William Alcock Tully, had his cartographers prepare a map of the southern portion of the colony showing the surveyed runs.